It was raining (proper rain!) from the morning. So I decided to spend more one day here. I was talking with Masa and Paul, playing Japanese chess. Before noon, Adam and Jessica left the hostel. They are travelling with a car, so the rain would not be a problem for them at al. They are heading to Slovakia, Czec from now on. Buen viaje!! So, I got othing muc to do again. What could I do? As it was raning, I did not want to go out either. We made instant noodle for lunch, ad a nap. 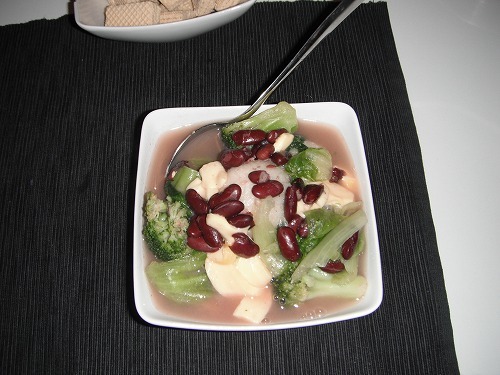 We made Pizy and kidney bean soup for dinner. Great nutritious food and cheap!! We had ice cream as a desert. Nice! Paul will leave to Czech. It will be raining in the morning, but t will be fine later according to the forecast. I am planning to get to Vysoke Tatry, Slovakia, some 150km away from her, so it would be an easy ride. The area is moutainous, so I will enjoy curves and nice mountain views. It was cloudy but not raining when I woke up. According to the weather forcast I checked yesterday, it would be raining today, but this morning I checked the forecast again and it stated cloudy, 0% chance of rain. So I could leave here. But I did not feel like leaving here yet. I am in a mood of "Ship Wrecked". I extendede my stay for one more day. Well, I had nothing to do today. 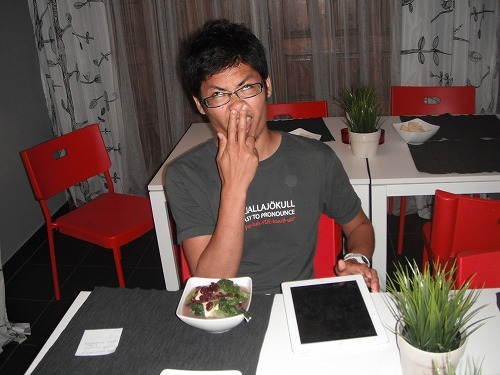 I spent my time with Masa talking. Paul made us pasta in the evening. After dinner, we were chatting and Adam and Jessica came out from the room after watching a movie. Which movie? Of course "TOP GUN"!!! It was the first time for Jessica to watch TOP GUN. Her verdict was "It was not the worst movie ever." Well, that was the harsh verdit on our (Paul, Adam and my) favorite movie. Not sure why, we started talking about Chuck Norris. 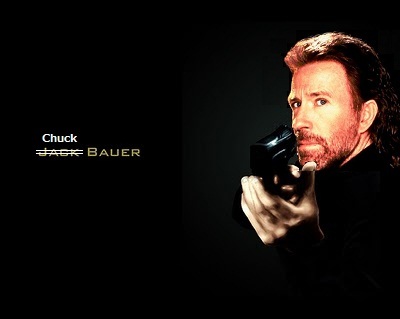 We played those movies of Chuck NOrris on YouTube and had fun. 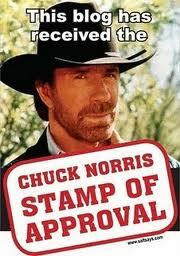 As I have nothing much to write today, I would like to share one of Chuck Norris Facts. 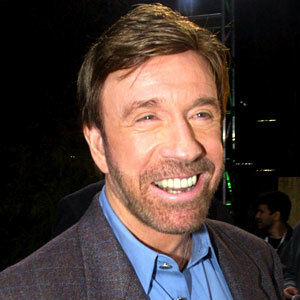 ”Chuck Norris can strangle you with a cordless phone." I was to leave Krakow and go to Slovakia, but I did not feel like leaving here yet. 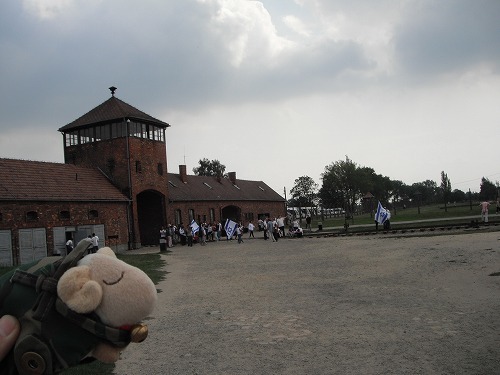 I had not completed the diary of visiting Auschwitz concentration camp either. So I decided to stay here one more day. Masa had not made up his decision where to go yet, so he was alos going to stay here one more day. Having breakfast, we chat, making plans etc. Last evening, a cyclist checked in to our dorm room, but I did not have a chance to speak with him last night. He is Paul from UK. 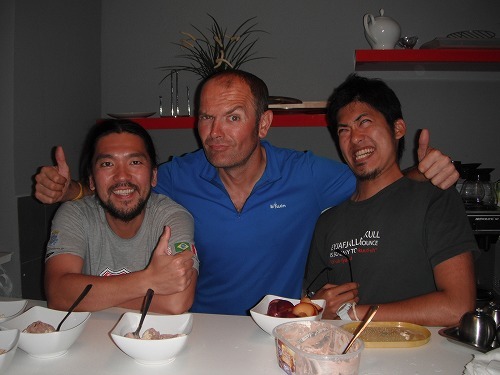 He was teaching English in China for 7-8 years and now he is cycling hrough Eurasia back to UK! We talked for a while and then he went to buy new socks. Masa and I went to a supermarket to get lunch. We bought smiked mackerels. WIth freshly cooked rice, it was really tasty! Masa could not make up his mind where he would go, so he flipped a coin and decided to head east! He had to go back to London by 12th of Sep. So he made a plan to go to Uklaine, then across Black Sea to Turkey, and fly out from Greece. We palyed Japanese chess a few times. He won. It was a hot day again. I had a nap, surfing the net and so on. Well, I did not make much today. 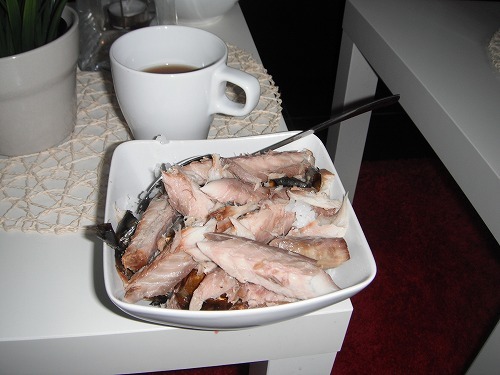 In the afternoon, I was talking with Masa about what to eat for dinner. 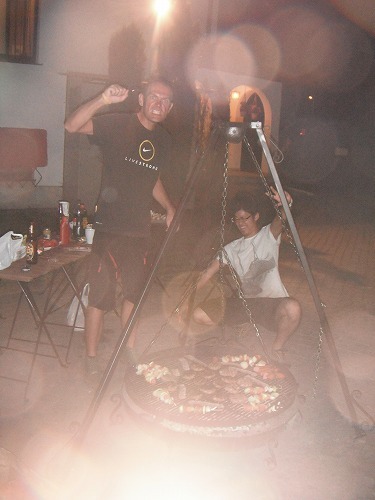 Masa said he wanted to have BBQ. Then Paul came to us and asked if we would like to do BBQed Hamburger with Adam and Jessica. "Why not!" We went to a supermarket to get ingridients. 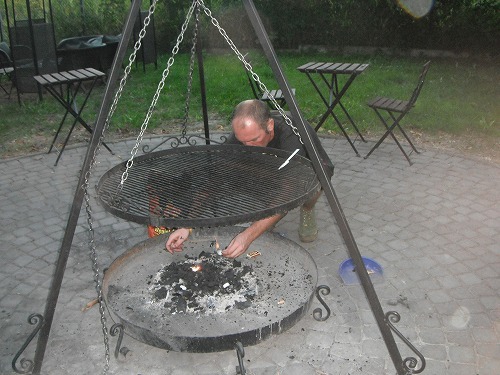 We set a fire on charcoal and wait. We made 15 burgers and put on the grill. They smelt fantasitc!! The end result was excellent!! Well done everyone!! Buen hecho!! I did not imagine I would have such a fun evening!! According to a weather forcast, the weather will be bad tomorrow... Should I stay one more day? 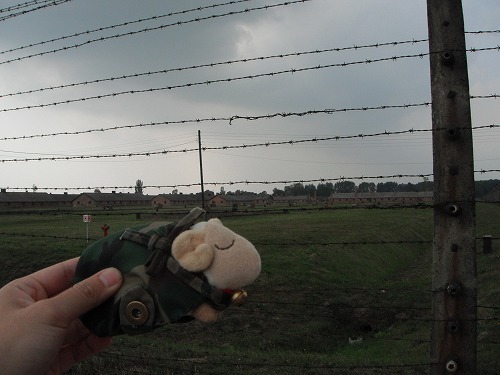 Masa, Mr. Sheep and I came back from Auschwitz II - Birkenau to Auschwitz I. 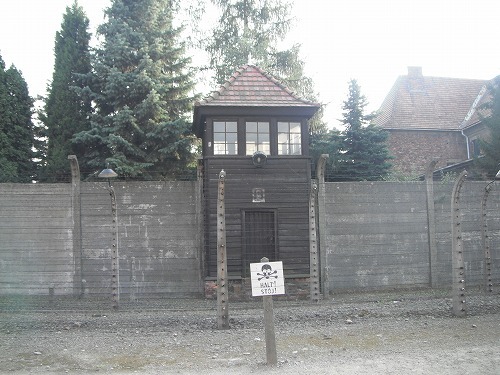 This is the famous entrance of Auschwitz I. 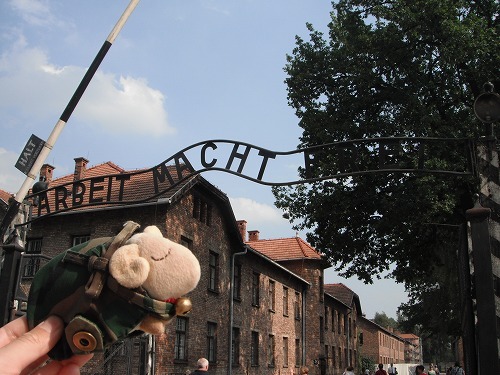 Above the gate, in German "Arbeit Macht Frei" = "Labour makes (you) free" sign. The letter "B" of "Arbeit" was placed upside down. It is said this was a resistence from the prisoners who were forced to make this sign. This German word "Albeit" is widely used in Japan now meang as "casual work". 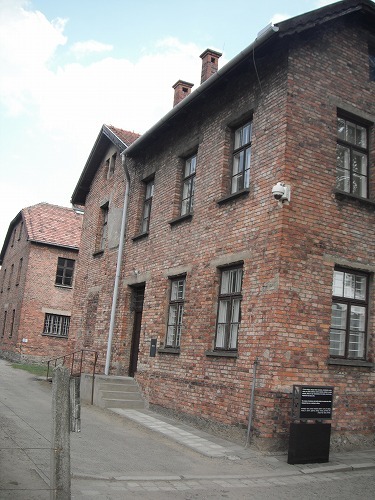 Those buildings of Auschwitz I looked like normal apartments. 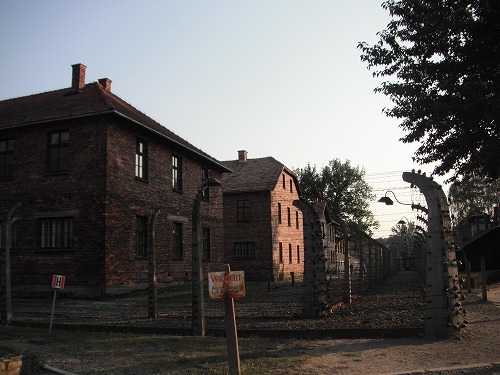 At a glance, there were much better than those of Auschwitz II. 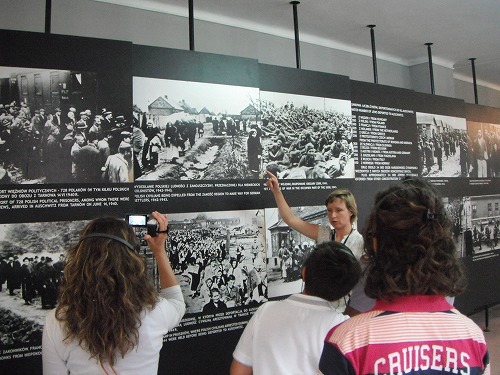 But once we entered the building, exhibitions told us how hard the life in the camp. There were lots of tourists in groups. Those empty cansof "Cyclon B" were found after the liberation of the camp. It is said that Cyclon B was used to mass murder those prisoners in Gas Chambers. 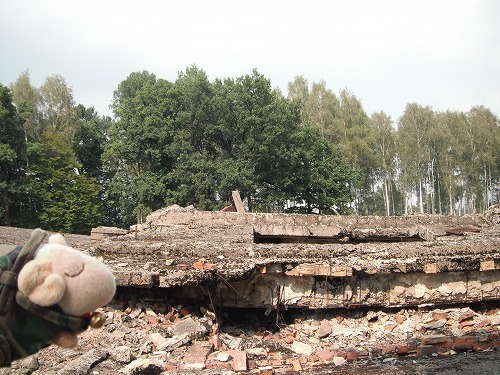 The factory of Cyclon B kept the records of deliverries, and according to the records.20 tonnes of Cyclon B were delivered to Auschwitz concentration camp. 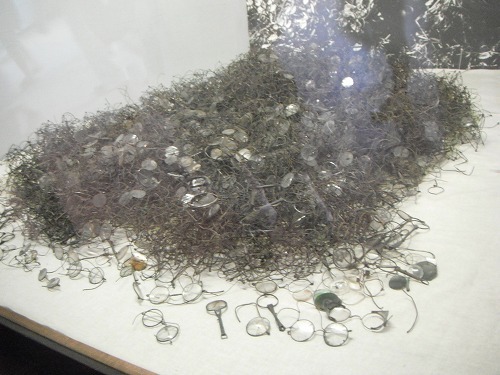 A part of glasses taken from the prisoners. There were ehibitions of shoes, hair, and bags / cases taken from prisoners (no photo allowed). What the most impressive was the amount of hair. It is said ihair was from female prisoners. 1,925kg of hair was found in bags, ready to be shipped to factories to make clothes out of hair. An example of meals provided for a prisoner a day. For breakfast, "coffee" - black coloured soup provided. For lunch, soup with alomost no meats nor vegies provided. For dinner 300g of black bread and 3g of margarine provided. Of course, those did not provide enough calories and nutritions to maintain good health. Malnutrition caused illness and death. Many suffered. Toilets. 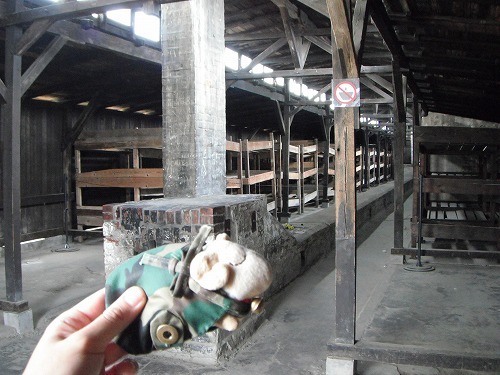 The condition was much better than those of Auschwitz II. 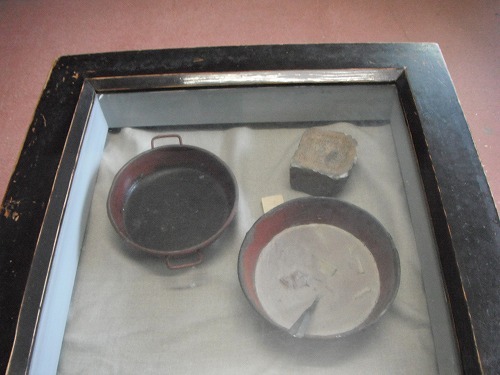 The part touching skin were made with wood, so skin would not stick to the toilet bowl when it was cold (I assumed). The "Death Wall" placed between building 10 and 11. 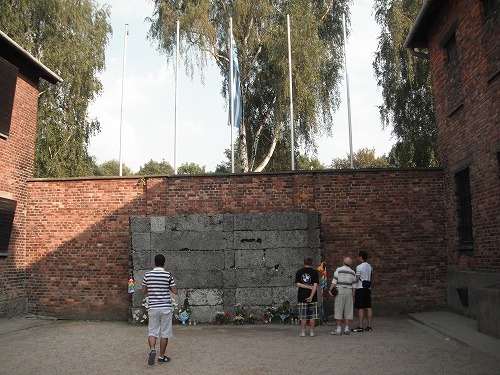 The wall was demolished by SS before the liberation, but after the war, the museum rebuilt the part of it. Barbed wires and a watch tower. The sign telling "Stop" . 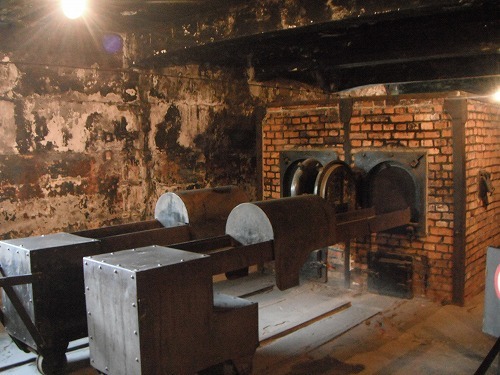 The gas chamber and crimatoria. 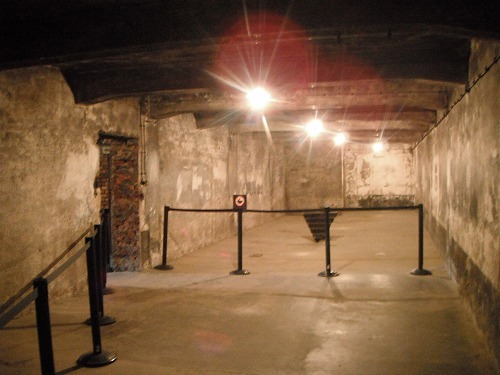 Here was the gas chamber. After letting the prisoners in, the door was locked, then cans of Cyclon B were thrown into the closed room. The door was shut for 20-30mins. None could came out alive. There were 4 crematoria. They were in full action to burn those bodies. Coke was used as fuel. After seeing Auschbitz I and II, we were convinced that these facilities were used for acts of evil. But we still have a doubt. The doubt is "Was it possible to brn 821 bodies each day for 5 years?". 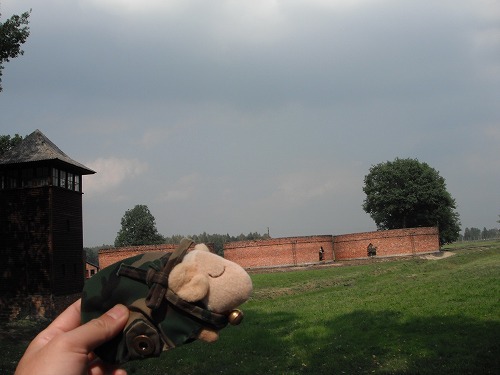 There were more gas chambers and crimatoria built, especially ones in Birkenau were larger and more efficient (2 buidlings were built with 12 crematoria installed each). However, those were in active for less than 2 years. 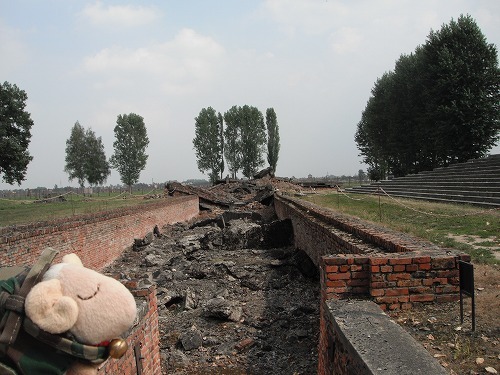 After the facilities were built in Birkenau, those in Auschbitz I were not in use. So we were still wondering if it was possible to burn so many bodies. Of course, it is said those excess bodies were burned outside, in the yard of the camp. It depends on how well the bodies were burned, but we assumed it would take lots of time and require lots of fuel. We ended our tour around 6pm. We caught a bus back to Krakow. I guess I was rally tired, and I was sleeping all the way to Krakow. 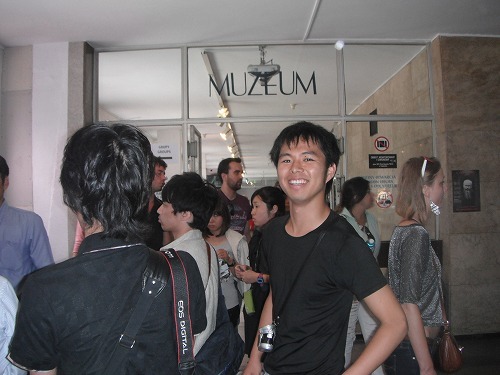 I visited the site with Masa to see it with my own eyes. We got to Central Bus Terminal where we caught a mini bus (12PLN) to Oświęcim. "Auschwitz" is Oświęcim in German. It took little more than 1 hour to get there. From the bus stop, we walked to the entrance of the site. 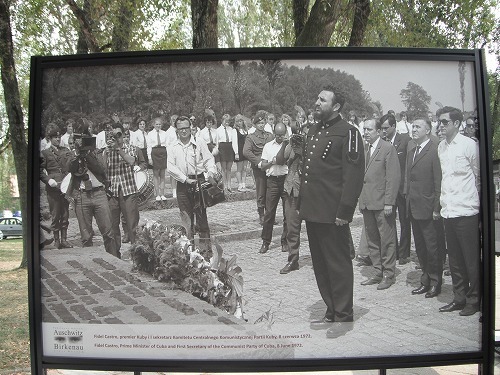 Before the entrance, there were poto panels ofthose political figures visited the site. 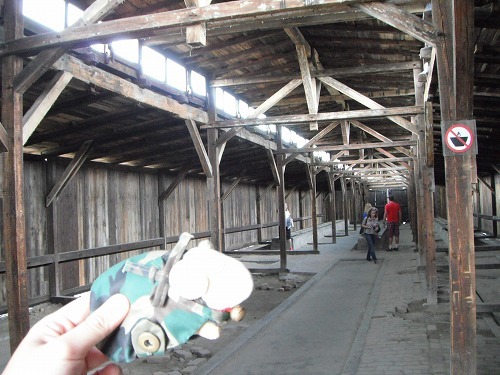 Until 3pm, in Auschwitz I it is required to join a guided tour. 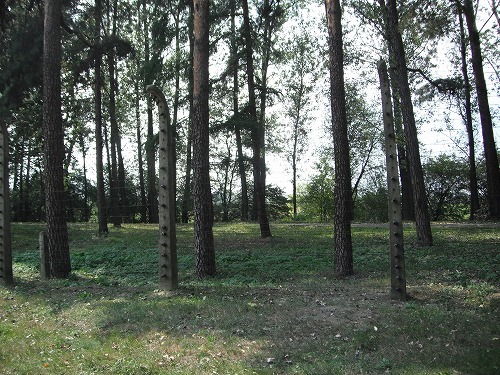 It would be good to get detailed information from a guide to understand the history of Auschbitz camps, but I wanted to walk arund with my own pace, and see and feel. 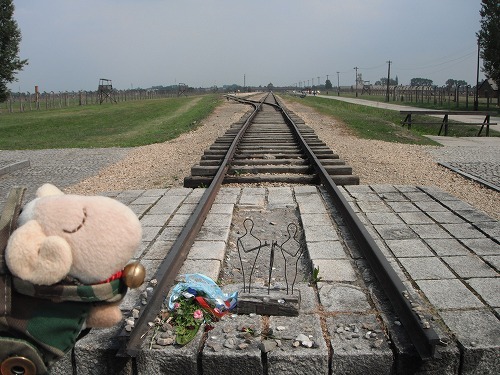 So we decided to start our visit from Auschwitz II (Birkenau). Here we saw the Japanese fellow again! He read my blog and told me his name this time. But I am sorry! I forgot his name!! Amigo, if you come to visit my bog again please et me know your name again! We caught a free shuttle bus to Auschwitz II - Birkenau. Many did not see outside world again. A barrack accommodated prisoners. It was originally designed to house 52 horses, but it was converted to house 400 prisoners. There were 300 barracks just like this one on the site. Triple loft bunk beds were put in the barrack. 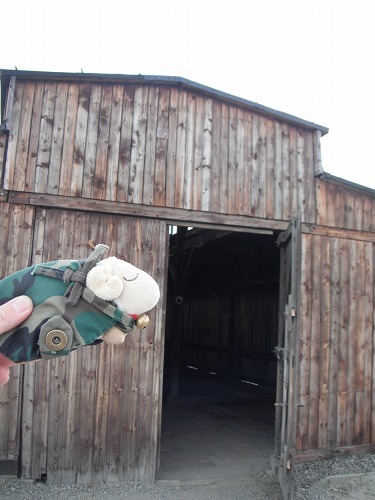 This barrack was designated for toilets. 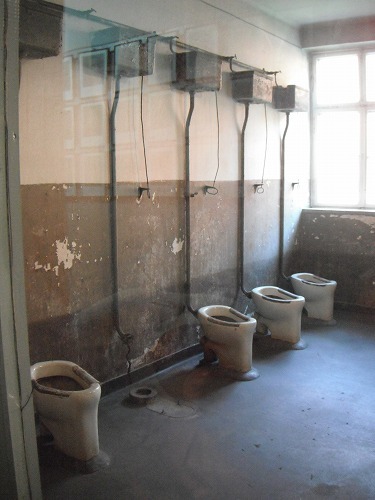 Prisoners were allowed to used the toilets at the certain times of the day together with inmates. There were 50 tripe loft bunk beds installed in a barrack (we counted them), so there were 150 beds available. It is said, 2 persons slept on a bed, but theycould accommodate only 300... Another 100 were? Where did they sleep?? It was very inhumane treatment. There was a heating device (stove) installed (brick made stove shown in the photo above). 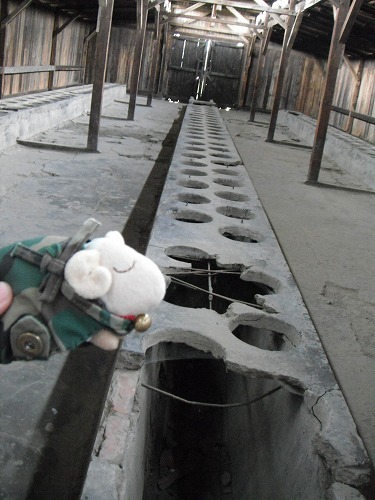 But it is said that there were many gaps on the buildings and if the cold winds blew in, the heater became no use. There were many vsitors from Israel. They wer in groups and were carrying Israeli flag. Here is the end of the rail. 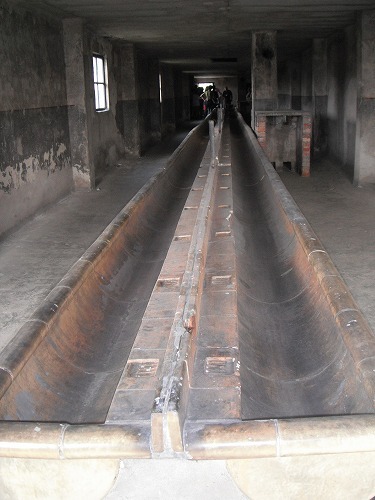 Both sides of the rail, there were gas chambers / crematoriums. They were demorished by SS on 20 Jan 1945 before Soviet Red Army free the camp. 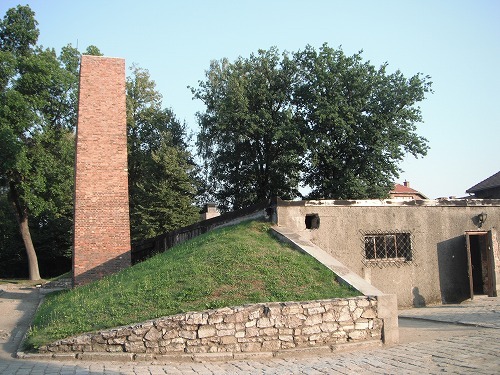 This is the remaining of the gas chamber / crematorium. 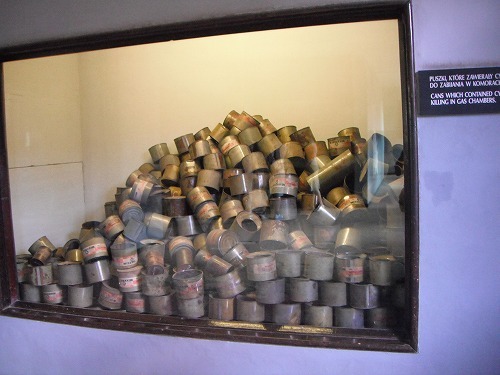 This is the remaining of a gas chamber. 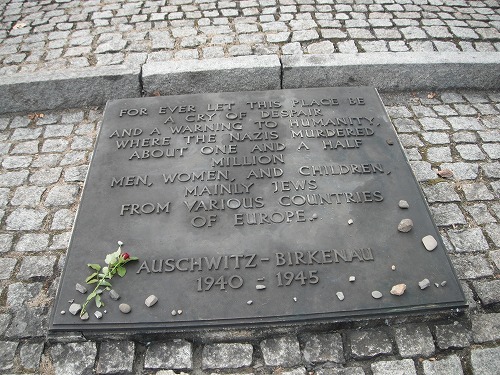 It is said "Many children and elderly were murdered immediately after arrival and were never registered." (Wikipedia) They account for 70-75% of people who were brouht here. There were sanitary treatment faclities installed on the site in order to cope with the growng number of poplation o the camp. Behind the arbed wires, there is a forest. So many poeple wished to go into the forest... I suppose. It was before 3pm. 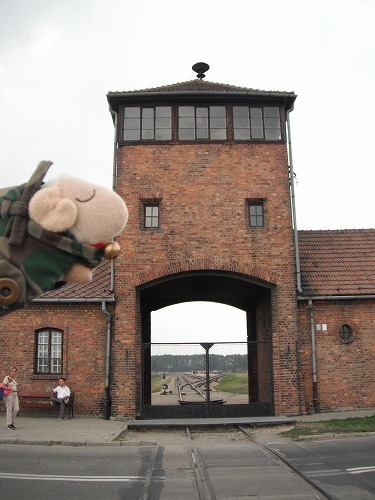 We caught a shuttle bus to Auschwitz I.
I was told to takeoff my beret. I asked "The reason why?" and the security guard pointed the star on my beret. Ireckoned he had a wrong idea with the start of "Comandante", but I did not want to argue, so I took off the beret and entered the site.